As the steamy months of July and August set in, blueberry season is upon us. Farmers all over the Midwest have sent out postcards to local residents reminding them to stop by the farm for a taste of the season’s best. Several farms in our area sit just a few minutes from our home. Making the daily drive back from work, I usually stop by for a large 5 lb. box of fresh picked berries. Years ago, our family used to picnic at the local blueberry farms as we would spend the early morning hours picking blueberries that would be eaten or frozen for future use. As my children grow older and our days a bit more busy, we have difficulty finding the time to pick berries as we once did. None the less, we still seem to find time to enjoy the flavor of these beautiful little gems. Preheat oven to 350 degrees. Spry with cooking spray a loaf pan. Mix flour, sugar, baking powder, and salt in a large bowl. Stir yogurt, milk, oil, egg, vanilla, and almond extract into flour mixture until batter is just blended. 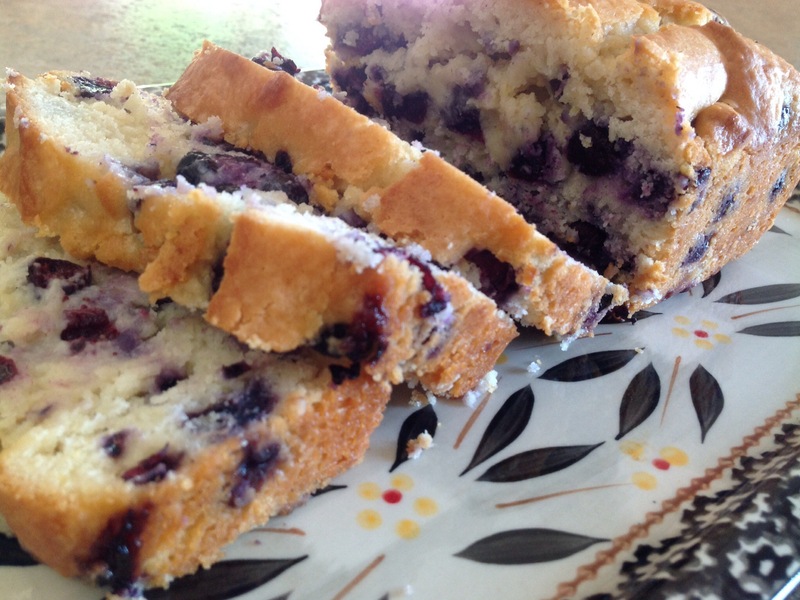 Gently fold blueberries into batter; pour into prepared loaf pan. Bake in the preheated oven for 60 minutes or until a toothpick inserted into the center comes out clean. Try Almond and berry berry blueberry tart recipe..
I’m gonna have to make this!!! This looks like an awesome summer treat! As you know, I can’t eat it but my family says it’s fantastic with a cup of tea or a tall glass of milk! Thanks for your comment, Shanna. This looks delectably delish! Thanks for sharing! Thank you for your comment! It certainly is delicious! This looks like a great recipe. Can’t wait to try it. Thanks for checking out my blueberry-lemon_zucchini loaf. My pleasure! And, yes it is a delicious loaf. Your recipe looked wonderful as well. Take care and thank you for your comment! I love how this recipe for blueberry bread doesn’t have nearly as much sugar and fat as typical quick breads and muffins! Right up my alley 🙂 I’m excited to make this while it’s still blueberry season. Thank you! Great blog by the way, and thanks for liking my post! You’re quite welcome! I’m glad you like the looks of the recipe…it’s a keeper!